Adrienne was awesome to work with. Super organized, professional, and most importantly made myself (the bride) and all of my girls look beautiful! At the our makeup trial, she really assessed my skin and listened to me for what type of look I wanted, and made me feel beautiful for my big day. You looked so beautiful on your wedding day. I enjoyed working with everyone in your bridal party. Thank you for the thoughtful review. I wish you a lifetime of happiness. Adrienne did my wedding makeup and I couldn't be happier with the way it turned out. She did my trial, looked at photos I liked, and was able to create a look that was flawless for the day of my wedding. She was even accommodating to my annoying dog who kept being a jerk while she tried to work. Her professionalism helped keep me calm, and I can't thank her enough for helping me feel beautiful on such an important day! Thank you Dana for the thoughtful review. I really enjoyed working with you and the dogs, they kept the day interesting. I can’t wait to see the photo of your bull dog getting his makeup done! Best of luck to the newly weds. Adrienne was a great addition to our special day. Not only was she punctual but her professionalism and attention to detail was much appreciated. She handled all of my wedding party and myself in a timely manner. For a day that can be stressful she kept all at ease and did the job I hoped for. Thank you! Thank you Andrea, I loved meeting your family. I hope the weather cooperated and you were able to get outside for pictures. 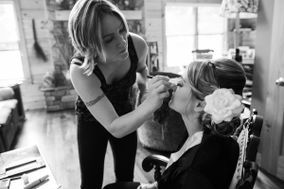 Adrienne was an absolute pleasure to have as the makeup artist at our wedding. 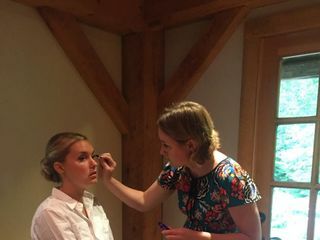 She did a fantastic job on myself, bridesmaids, my mother and my grandmother on the day of the wedding On top of that her calming presence was great to have and contributed to a really fun day of getting ready for the wedding. Thank you for hiring me to do your makeup on your special day. You have so many special people in your life and I enjoyed working with everyone. I wish you a lifetime of happiness. Adrienne was a perfect pick for my wedding! 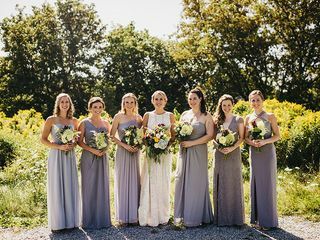 In addition to doing a great job -- my bridesmaids and I were very happy with how we looked -- she was very accommodating and had a lowkey attitude that didn't add any stress to the day. 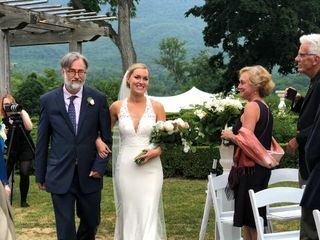 When I changed my mind or had specific requests she was always willing to go with the flow, and her "minimums" to travel to the wedding site were much more reasonable than other people I spoke to. 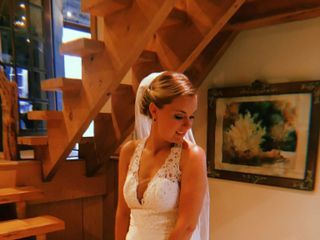 Adrienne is perfect if you're looking for someone with reasonable costs who is willing to customize her services to match your particular vision for your wedding. And she's a very talented! Adrienne was such a pleasure to work with! She was friendly, easy to talk to and didn't mind that I didn't have much of a makeup vision in mind. She kept all my girls looking naturally beautiful but picture ready. She also was especially kind to my mom who was super nervous to get her makeup done. When my Mom was finished, she was almost crying! I highly recommend using Adrienne for your wedding makeup needs! Thank you for hiring me to do your makeup on your wedding day. I enjoyed spending your time with your friends and family. Everyone was a pleasure to work with. Adrienne was professional, punctual, and extremely communicative throughout the wedding planning process! Day of, she arrived ready to go and made my bridesmaids and me look fab! I should note that due to distance (I live in CA), I was not able to see Adrienne for a trial before my wedding day. Despite this, she arrived with a plan and pulled off a fabulous makeup job. All of our makeup lasted all day and night and drew a lot of compliments! She was able to give us all a high quality, polished look without anyone looking goofy or gaudy; perfectly natural and bright. Any bride in the VT area should highly consider booking Adrienne! Thank you for hiring me to do your make-up on your special day. I enjoyed working with you and your friends. Everyone looked beautiful and I'm glad you received alot of complements. Adrienne was wonderful to work with. She is the only makeup artist that I've ever worked with that didn't make me feel like I was covered in make up. I truly felt like I looked like myself for my wedding day and I so appreciated Adrienne willingness to execute that. She was such a calming presence on the wedding day and everyone loved their makeup! Thank you for hiring me on your wedding day. I enjoyed spending time with your family and friends. Everyone was positive and creative with the different look's we created for each of you. I had a pretty negative experience with this vendor and I think is worth sharing for future brides/potential clients. I live 4 hrs away in Boston and planned a destination wedding in Southern Vermont. Due to Pure Complexion’s limited availability of weekend appts, I missed my first scheduled trial (4hr drive + delay with our caterer) and eventually had to take a day off of work to accommodate their availability (drove up Sunday, had trial Monday). During the trial, I was really underwhelmed by the lack of effort made to understand my skin type and/or eye shape as well as the limited color options available for shadows, liners, lip color, etc. I was not happy with the look we achieved, but I did not have the ability to travel to Vermont for another trial. Sadly, I had already paid a deposit because it was required in order to secure an appointment on my wedding day. Although their website indicated a 5-day cancellation notice and the receptionist took my credit card info for a refund, they never refunded my deposit nor did they call to notify me of their intention to refuse. Instead, I called back more than a week later and was told that my deposit was non-refundable and “that’s just the way it is.” I felt pretty frustrated by their lack of professionalism and powerless because they already had my money and a signed contract. The stylist never attempted to contact me to work out a reasonable alternative. Instead, I offered the appointment to my mom and sister, walked away from the deposit money, and ended up doing my wedding makeup myself. In retrospect, trusting this vendor was a mistake; I feel foolish for being pressured into paying a deposit before being able to attend a trial and for taking time out of my workweek to accommodate their inflexibility. I should have just looked elsewhere. In the end, I feel that this stylist was more focused on getting (and keeping) my money rather than on helping me plan a successful wedding day. I'm sorry you were dissatisfied with our services. We do have a 90-day cancellation policy with deposits because our wedding season is very busy. Customer service is very important to us, which is why we accommodated your unique situation by adding your mother and sister's makeup in exchange for your deposit. If you would like to schedule a phone conversation to speak further, we would certainly be willing to talk to you about this..